Cast: Brad Pitt, Orlando Bloom, Eric Bana, Brian Cox, Sean Bean, Peter O'Toole. Story: Trojan Paris steals Helen from Greek king Menelaus. Menelaus and brother Agamemnon wage war on the Trojans. Running Time: 163 minutes, feels like 163 days. TOO LONG! TOO LONG! Eurgh, I hate getting bored with movies half way through. The show needs to be pretty special to support nearly three hours, and sadly Troy isn't special enough - by about an hour and a half. The word "epic" - now what does that mean? Does it mean "expensive"? Does it mean "features lots of stars"? Does it mean "contains impressive special effects"? I think movie directors are under the mistaken impression that "epic" means "shows lots of characters on the screen at the same time". Thus they seem to think Gladiator is epic (not in my book), and the same with Troy. Yes, there are lots of computer-generated people on screen (who look impressively real) and the impression of a complete army is effective, in look at least. However, the epic-ness is lost by the hamming up and dragging out of the major scenes. The story is well-known, the messages are shallow and childish and the whole effect is unsatisfying. For example, one characteristic moment is during a battle featuring tens of thousands of warriors - two of the main protagonists have their own scrap in the midst of everything (I won't tell you who as it's vital to the plot). Besides the daftness of everyone else conveniently giving them room to fight without getting involved, when the scrap ends, the entire battlefield magically goes silent, the winner says "that's enough for today" and everybody stops and goes home! I don't know much about archaic combat, but I'm sure as hell that mass telepathy wasn't a factor. This moment epitomised the emptiness of the film for me and it just got worse from there. Brad Pitt doesn't quite feel right in the part of Achilles, however his performance is marvellous as usual, his character being the structural tendon rather than the vulnerable heel amongst a sprawling array of performances that, on the whole, try too hard to fit the "epic" tag. Eric Bana (Hulk) scowls his way through as the Trojan warrior Hector, Peter O'Toole rattles another few screws loose as King Priam and all the women stare wide-eyed and helpless as their big strong men do their various big strong man things. Helen of Troy is portrayed acceptably by Diane Kruger - and it's a good idea to have an unknown actress playing the part of "The Most Beautiful Woman In The World". However, I think it's fair to say that if her face can launch a thousand ships, a million-plus is not out of the question if you know how to look. Bizarrely, Sean Bean's chilled Odysseus somehow works (though I'd never have believed it had I not seen it) and Brian Cox pops in a meatily vicious Agamemnon that is nothing short of perfect. Had the movie concentrated solely on Achilles, Odysseus and Agamemnon and done away with the tedious muddled combat scenes, it would have been massively more watchable. One performer I've saved for particular savaging is Orlando Bloom. Am I the only person on the planet that thinks that Orlando Bloom is a galactically BAD actor? The man is a self-spoof. I can't watch any of his pantomime one-dimensional performances without expecting a joke - I genuinely believe his future is as the new Leslie Nielsen. I keep expecting him to say, "don't call me Shirley," and was continuously reminded during Troy of Charlie Sheen's Hot Shots: Part Deux. Anyway, rant over. If he's cast as Buttons next, I'll be saying all nice things. Time to wrap up before I go all Petersen on you. I enjoyed the first hour of the story, it was big and brash and unashamedly entertaining. But then it tries to go all epic and it all goes horribly wrong. Why didn't Mr Petersen roll the credits at the 90-minute mark? 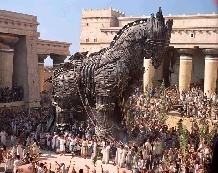 Because then we wouldn't have got "The Trojan Horse". Well that's all OK then. Testosterone Satisfaction Rating: 1/5 The trailer suggests that Helen of Troy shows skin, but that's a Troy ploy. Some gladiatorial carnage and those "epic" effects are all we get. To enjoy this film you should be: Caffeined up.